So, this happened quite some time ago now… I blame Animal Crossing for the delay…. oops! The moment my friends and I clapped eyes on this poster, we knew this was going to be a night out for us! 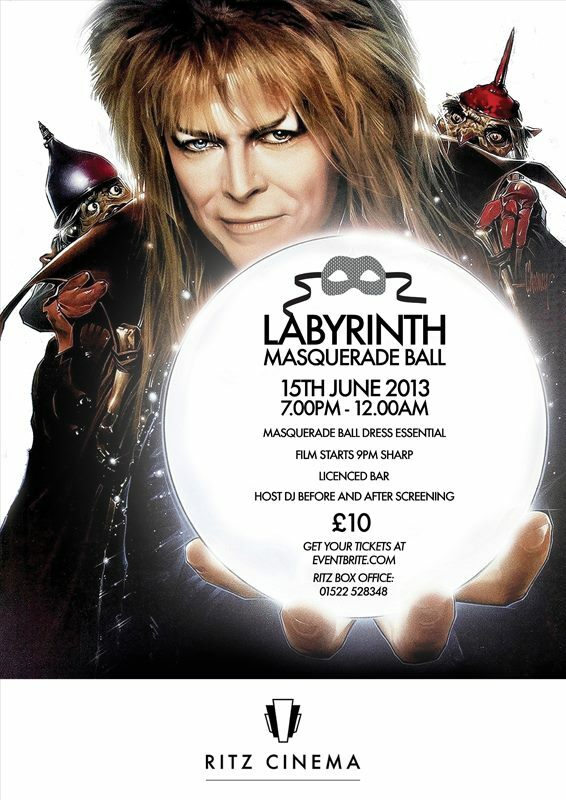 Formal wear, Masquerade, Cocktails, Henson Puppetry AND Bowie tunes. What more could you want in an evening? We booked the tickets the day they were released (good job too as it had completely sold out!). However, somewhat predictably, I had left my costume to the very last minute. I had found a sparkly, formal-esque dress at a vintage fair which was very lucky, but the rest was a quick Amazon order earlier in the week. I bought a black lace cat mask, a black Pashmina (factory second, but absolutely flawless to my eyes) and some elbow length gloves… Feelin’ fancy! Had I been organised, I ideally would have created my own mask in the style of the goblin ones from the Goblin Ball scene in the film. I had grand plans involving paper-mache, pearls and gold paint… but this never materialised. My outfit, though looking very fancy, was just not ‘Labyrinth’ enough. 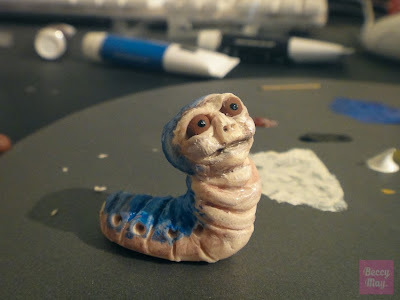 I got-going making a little worm guy! 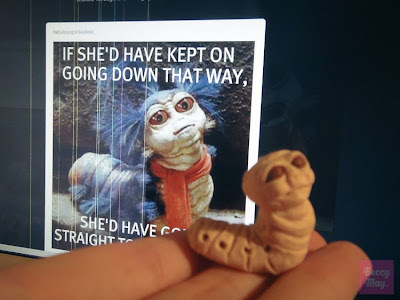 I had seen some lovely handmade polymer clay rings on etsy modeled after this nameless hero and thought I’d give it a go too. Sculptor, I am not. But I think my hasty muddle together of this piece worked quite well in the end. Aaah! 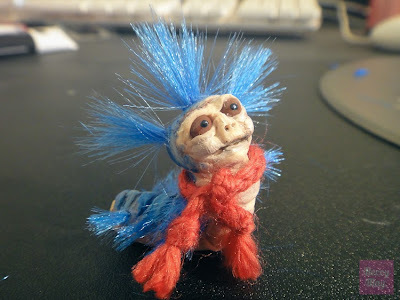 The stuff of nightmares… or at least very odd dreams. 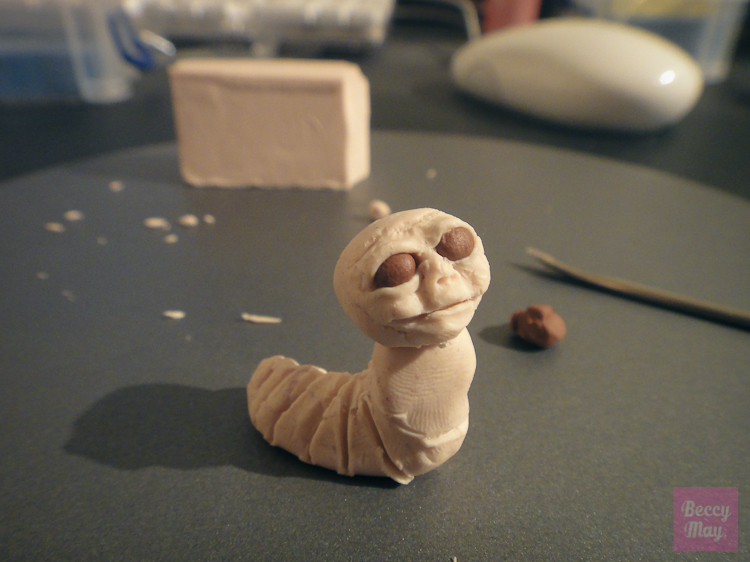 First, I created the base shapes out of a neutral colour of Super Sculpey. Following a picture on my computer monitor as a guide. I got all excited and only started taking piccys once I got this far, so sorry about that! the eyes were made of a reddish brown and places in the empty socket hollows before eyelids were added on top. 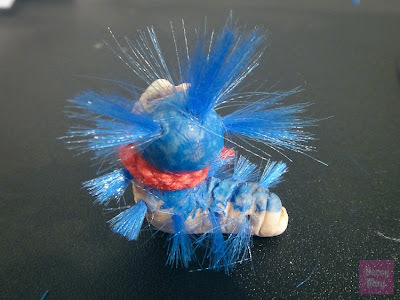 Once I had got the body and head the way I wanted them, I poked holes down each side of the body and head where is little sprouts of hair are. He was then popped into the oven for 20 mins to set. Once cooled, I painted him with acrylic paints. For the record, I was not pleased with the mouth, but this was a last minute affair after all so as soon as it was semi-acceptable, I left him to dry. While he was drying in the sunlight (how lovely the weather is at the moment!) I searched for something suitable for the fluffy hair. 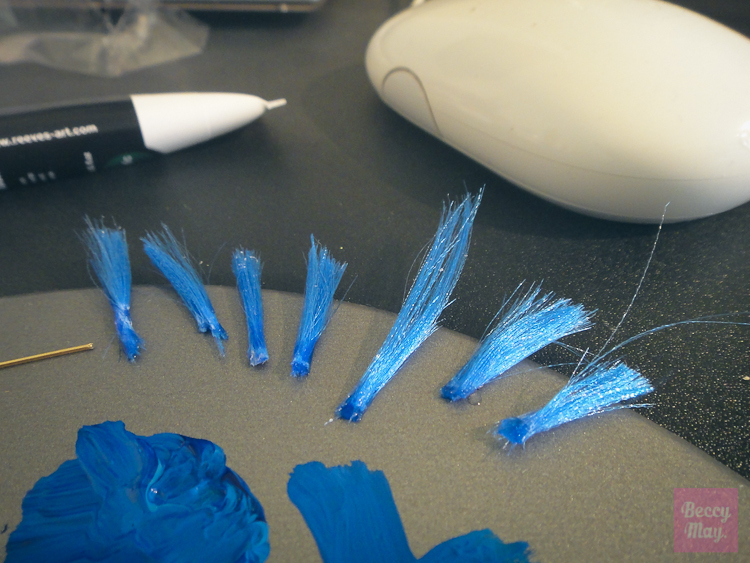 I ended up stripping down some blue ribbon. Do this by fraying the end and keep going! Pull the ribbon apart and keep hold of the long lengths that are left. It’s kind of hard to describe but oh-so satisfying to do! Just don’t drop the long parts as gathering them up neatly is nearly impossible. 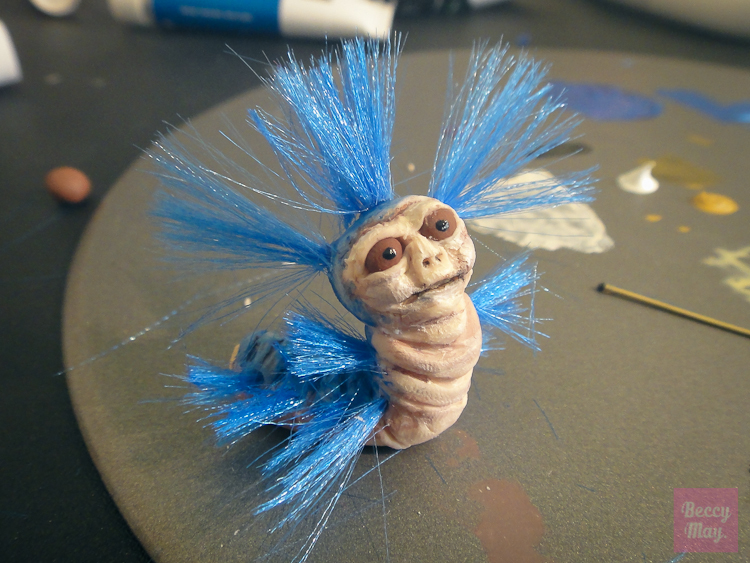 Labyrinth worm: 70s punk edition. Considering this was a last minute rushed panic job… I was sooo pleased with the results! He is so cute. I bounded outside for a quick photoshoot in the garden. This started out intended as a ring… but… I changed my mind! I was taking a small black handbag with me and thought he would look so cute just perched on top. 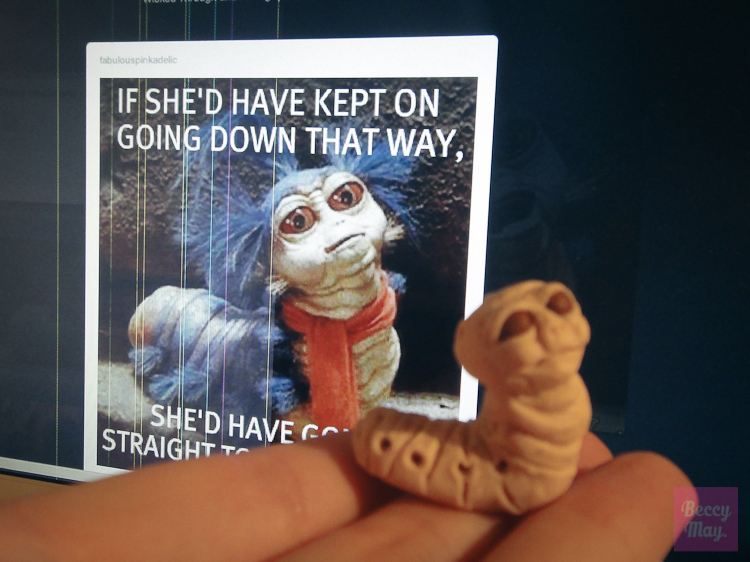 So I glued him on. Luckily it was a rather old handbag that was more than likely on it’s last outing anyway. He looked great, like he had just tagged along for the evening hoping to be unnoticed! Overall, I was very pleased with my quick creation, and a fabulous evening was had by all at the Ritz Cinema. Everyone who attended looked amazing. Corsets, frills and masks everywhere! 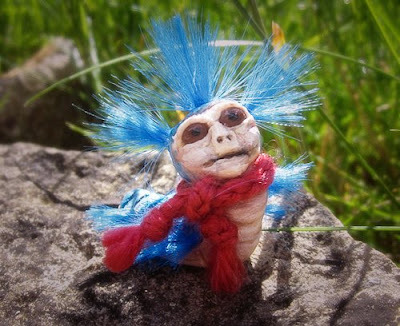 Someone even went as far as to dress up in full goblin king fancy-dress. 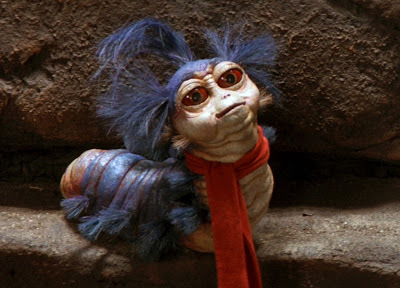 The Worm scene from Labyrinth!